The last time I went to Labi was around 15 years ago and that was for our school trip. The only thing that I remember at that time was that the road was hilly, small and winding road. Last Sunday, I’ve decided to join the Labi Ride organized by Sofian Thani. Around 22 cyclists showed up and around 7 cyclists are1st timer cycling to Labi (including me). Sofian have organize it a couple of times ( I think more than 5 already) and most of the time I did not join partly because my other team mates are not going. But this time, I’m not going to wait anymore, I’ve decided to join the group ride alone and guess what. It was fun and enjoyable. I’ve read from Hamsul’s blog ( he & Ahmad went there last July 2009) that the Labi road condition was torturing and mostly the hill climb are very long. At first I tried to follow Hj Abu Bakar and 3 other cyclists. But when it comes to the flat road, Hj Abu increased the speed to 40k/h where I just managed to stay for a few minutes and then I have to drop back (nda tahan), left behind. Then comes the next group of around 4 cyclists. This time their speed was around 35k/h and I managed to follow them all the way to Labi. My kind of speed. Finally we arrived at Labi Checkpoint – the small shop where we rest for about 45 minutes while waiting for other cyclists to arrive. I was lucky to arrive early so more rest time compared to those who come later – maybe only 20 minutes rest. We continue the journey back to Sg Liang around 10am as ONE BIG GROUP. We stayed as a group for about 15 to 20 minutes and when the first hill approaches, the group begun splitting up into smaller groups. I managed to follow the main group of 12 cyclists – Mostly the PRO riders and I’m the only 1st timer LABI rider in the group. Hill after hill I’ve managed to stay with them mostly in the middle pack and sometime in front but never in the back - (lesson learnt – don’t stay at the back if you’re not a good accelerator, you might fall behind – way behind). Once again, I’m a newbie to this area, so I didn’t know what exactly the challenges coming ahead. I totally forgot about the last 10km of the road even though I pass it a few hours ago in a different directions. Now it was 10km non stop uphill climb with a few short flat road for recovery. Look at the graph above (picture copied from Hamsul’s blog) – The green line is the elevation. 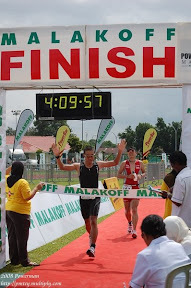 The last 10 km – 64km marker, it is uphill climb all the way to the finishing line Sg Liang recreational park. I was totally left behind. They were so strong and fast that I cannot catch up with them. The only person I saw was Sofian Thani way infront of me. He was also falling behind the group but after a while I cannot see him anymore. That guy has strong leg power. Total distance covered 73.71km in a time of 2 hours 37 minutes. The time taken to go to Labi and the time taken to get back to Sg Liang is almost the same. I thought we were going faster on the way back. I’m pretty much happy with my achievement since I only did 3 road ride after hari raya and the ride was mostly happy-go-lucky ride. Definitely I’ll do it again in the future and this time with preparation.